Menu not working in your mobile browser? 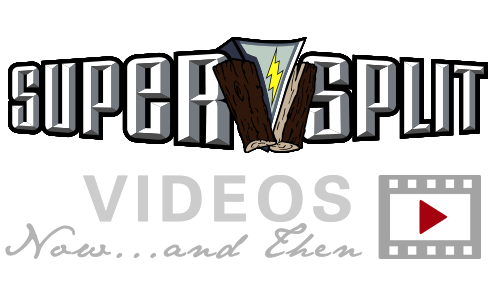 That's me — Paul McCann, the owner of SuperSplitter, Inc. — just setting into some log splitting as it really happens with the SuperSplit. No fancy video effects, bells or whistles (I figured you won't have any of that stuff when you're out splitting your own logs, and that you'd appreciate seeing reality) — but you'll easily see that, using the SuperSplit, reality gets pretty awesome! I intentionally throw a variety of log types in the mix here, so pay attention and you'll learn a trick or two about dealing with extra-large logs, knotty hardwood, etc. I make a pretty big point of the fact that we own the patent for the original kinetic log splitter (1978), meaning that every single other kinetic splitter you find on the market is, in fact a knock-off: some attempt at immitating the SuperSplit. Being THE ORIGINAL and having been in business so long means that we have a few old gems from yesteryear lying around, including this retro video of the very first SuperSplit model in action — which many of our customers STILL own, use and love today! We've changed a few minor things since then (e.g., an on/off lever instead of a knob), but we are still "the fastest and most efficient."